The D-D NanoScope is a cool little gizmo that makes it easy to see corals, pests and other small creatures up close. The D-D NanoScope opens up a hidden world, and allows the hobbyist to look at their created ecosystem from a new perspective. 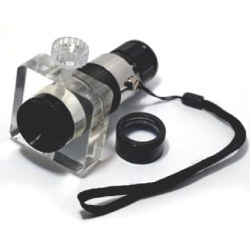 This powerful little scope magnifies up to 48x actual size, and is supplied with a flexible tripod which attaches to the front of the glass with a suction cup. So if you’re wondering about red bugs (before beginning a Red Bug Interceptor treatment), or just want to take a closer look at your prize chalice, acro or acan, check out the D-D NanoScope. It’s currently available at Premium Aquatics for $99.99.